It was really good to see James Morton take the lead in supporting the Young Liberals. A lovely letter of thanks and support from Mateusz. Enormous thanks to James Morton, Candidate for VP (English) of the Liberal Party of Canada, who contributed $250 to sponsor a Young Liberals of Canada delegation to the UN Conference on Climate Change. Young Liberals are working hard to raise funds and are counting on your support. James has challenged all the National Executive officers and candidates and their friends to match or better his generous donation. Our exceptional young delegates were selected though a competitive nationwide process and are organizing town halls in their communities to inform other youth about climate change and our party’s proud record of environmental achievements. They look forward to taking Liberal pride to the United Nations Conference on Climate Change. Please support James Morton’s challenge by forwarding this challenge to Presidential hopefuls Sheila Copps, Mike Crawley, Alexandra Mendès and Ron Hartling and Director Candidates Zack Paiken and Kyle Harrietha, as well as your friends and colleagues. Click here to meet the Morton Challenge. There is a small subculture of political animals. They include the backroom people, the talking heads, the policy wonks, the koolade drinkers and a few more species. Then there are the rest of us. We watch the news and keep track of what is happening in our country and our world. We sometimes watch the political animals roaring about real and perceived slights and issues, subtly discounting much of it as noise. We regret that there is so much noise going on in the capital that the positive things most of us agree on rarely seem to progress. When it comes time for an election, some Canadians barely pay attention. Others, including myself, look to see which candidates and which parties most reflect our interests and philosophies. We see this as important because we have to trust that our representatives, once elected, will passionately and effectively reflect our interests. As we come closer to the next federal election (not saying when, just that it will inevitably come) I look to people who I have known for years and watched gather impressive accomplishments. Once such is my friend, Karen Mock. 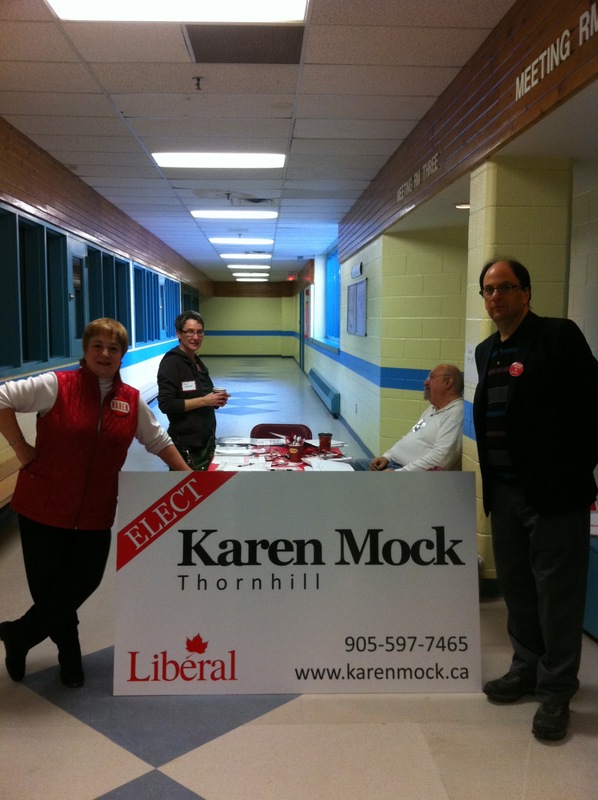 You can start to learn about Karen from her candidate web site, at http://karenmock.liberal.ca. But to get the full picture, Google her. You will begin to understand my support. Karen is a woman who leads both by consensus and with strength. Have a look. Do your research. I am confident that you will be impressed with Karen.